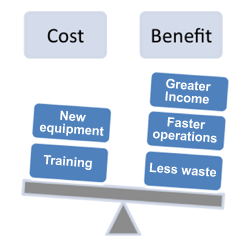 Cost Benefit Analysis or CBA is a widely used method designed to help decide whether the implementation of a specific course of action is cost effective. The method involves placing all the costs or disadvantages on one side and all the benefits or advantages on the other and measuring the difference. If the benefits outweigh the costs, the course of action is deemed worthwhile. If the costs outweigh the benefits then an alternative solution needs to be found. The first step involves deciding on the common denominator – what common unit will everything be measured in. The most common unit used is monetary with the simplest case of CBA involving subtracting the financial costs from the financial gain, giving either a profit or a deficit. Some benefits may not have a direct monetary value but there is some value of money which is the equivalent of the benefit. An example of this is that the time saved doing something can be expressed in the percentage of that person’s wages. The problem comes when you have to take into account intangible components that cannot be given a definitive figure for example environmental factors. These therefore require an estimated value which can introduce an element of subjectivity. Another important thing to consider when calculating the values is the time delay of the profits and working out how long it will take the benefits to repay the costs. The problem is money in the future is not as good as money today and so a discounted value needs to be calculated. This is due to the fact that a specific amount of money now can be invested and so will be worth more than when you actually receive the money. This is known as the discounted value.